Can we dress the deceased? You may like to choose a favourite piece of clothing for your loved one to depart in. The deceased can wear their own clothes, gown or a breasting (which is a head to toe dignity cover.) If you choose to place clothing on your loved one please remember to include underwear and shoes. Your loved one’s hair and makeup will be done. Sometimes a photograph is requested by us to match makeup or we may ask to use the deceased’s own makeup. Jewellery such as wedding and engagements rings can be placed on the deceased as well as rosary beads. Can my loved one be buried somewhere other than a cemetery? Public Health regulations are always the first consideration when dealing with the deceased and burying them at a place other than a cemetery. Burial at sea is determined by government authorities such as the Public Health Unit, Maritime Services Board and the Royal Australian Navy. Each application is generally dealt with on a case by case basis. Can the funeral director stop me from viewing the deceased? Sometimes to limit infectious diseases due to Public Health regulations a viewing may be refused. If the body does not carry any infectious diseases viewing cannot be refused. We take every precaution with the deceased especially when dealing with infectious diseases and the controlling of them. W Larcombe & Son are there to ensure that every detail is attended to as your family has requested. Our role is to guide the family through the arrangements in a caring and understanding manner. You can speak with us at our office or in your home, wherever you feel most comfortable. Specifically the duties of a funeral director are to: Meet with and discuss the many aspects of the funeral with the family, setting out the various choices available and the costs involved. Once the funeral arrangements are set, liaise with various organisations which may include clergy, cemetery, crematorium, hospital, doctor, and service organisations to confirm arrangements. Arrange to collect the deceased from the place of death and prepare for viewing. Place Death and Funeral notices in local and metropolitan newspapers. Organise any family floral tributes. Conduct the funeral on the day and time decided. Finalise the necessary paperwork to ensure all legal requirements are met. The family has absolute choice with certain exceptions as in the case of a Coronial Investigation where in some murder cases permission may be given for a funeral by burial only. Our Funeral Directors can volunteer options to a family but it is the families’ right to choose whatever they wish providing necessary legal requirements are met. 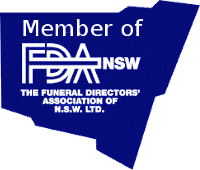 There may be some variation between states and territories within Australia, however, in most instances relevant Health Departments require the deceased to be placed in a coffin or casket for burial or cremation. In the case of a cremation the coffin/casket must be combustible. Again in certain states funerals may be Government assisted in the event of insufficient funds. Such funerals have limitations on choices. How much time do I have to arrange the funeral after someone passes away? Generally a funeral director can hold an unembalmed body for up to seven working days. Any time after this time frame would require the body to be embalmed. Once a body is embalmed, there is virtually no time limit on when the funeral needs to be held. Is it compulsory to use a Funeral Director? A regulated company such as a funeral director that has access to a mortuary and that complies with the appropriate health regulations is necessary when dealing with a deceased person. If the doctor is unable to certify the cause of death it is necessary to contact the police, who then will liaise with coronial staff. This will be necessary in such instances as: Death other than by natural causes, including violence, accidental or unusual causes. Whilst under anaesthetic (or within 24 hours of the administration of an anaesthetic). Unexpected death. Death of a person in an institution, a prison or in police custody, drug or alcohol rehabilitation centre. When the cause of death is unknown. When the deceased had diagnosed dementia. Coronial staff or a Government appointed Funeral Company will transfer the deceased to the Coroner. In the instance of deceased with dementia this may not be deemed necessary following police determinations. A post mortem examination, also known as an autopsy is a detailed examination conducted to establish the cause of death. This examination is carried out by a doctor known as a pathologist. We will then liaise with Coronial staff regarding release of the deceased into their care. Will I receive my loved one’s ashes and what reassurance would I have of receiving them and no one else’s? An identifying name plate is placed on a coffin prior to cremation. Before cremation precedes the name plate is removed and used as a marker for the remains. The deceased ashes are then packaged in an urn for us to take back to our office premises for the deceased family to receive.